Straight Up Chess is one of the world's most unique chess sets. As you pass by, make your move, mark it with the “Last move” marker and go on your way. Later your opponent stops by, makes their move and the game continues. This is a fun and entertaining piece of "functional" Art that will add an element of class to any room or hallway in your home or office. Under the 'Straight Up Chess boards' menu, order complete sets as shown with background, frame and chess pieces for one price or design your own under the Build Your Custom Board option. If you already have a unique set of chess pieces and just need the board, you may build a custom Straight Up Chess board designed around your chess pieces. 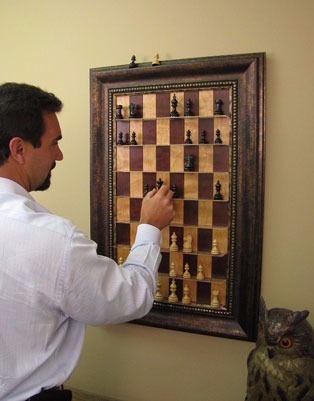 Boards can be made to fit chess pieces from 2" to 4.5" sets based on the tallest piece in the set. I can't imagine playing on a flat board again, this is way too much fun. The board and pieces arrived today and I have it hanging in my office. One word: AWESOME! You do great work! Thank you very much! The board is even more beautiful than the picture lets on. Thank you, thank you, thank you! Can't wait to get this set up in our living room. Not only is it a beautiful chess board, it doubles as a piece of art!